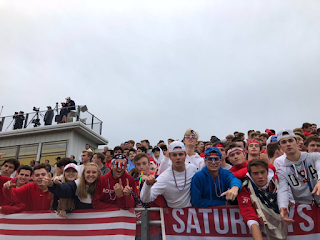 St. John's Shrewsbury fans came out in full-force to witness their Pioneers defeat No. 11 Shrewsbury. Anyone who thought that St. John's Shrewsbury was going to go down without a fight in Div. 3 Central was proven to be mistaken on Saturday afternoon. The Pioneers highlighted the week five slate with a 42-34 win over cross-town rival Shrewsbury with the dynamic duo of Colin Schofield and Jay Brunelle continuing to click on all cylinders. Colin Deso came through with the defensive play of the day, stuffing a Colonials' two-point attempt with Shrewsbury trailing by one late. Elsewhere, No. 10 Needham continued its impressive play to begin the season. Taylor Reid rushed for a pair of scores, while Joe Anastasi, Mason Colwell, and Niall Dolan combined for eight sacks. Holliston improved to 5-0 with a 28-7 win over Hopkinton, and No. 2 Xaverian put up another classic defensive performance with a 14-0 shutout of Brockton behind the play of Mike Masse. Any thought of Duxbury relinquishing its decade hold on the Patriot League Keenan division was quickly squashed on Friday night. The No. 12 Dragons handled No. 13 Hingham from beginning to end to come away with a 38-20 victory. Falmouth inched closer to clinching the ACL title outright with a huge win over Dennis-Yarmouth. And if there was anyone thinking that its win over Lincoln-Sudbury was simply a fluke, No. 14 Acton-Boxboro put that to bed with a 30-14 win over Dracut. Here are our top performers from week five of the MIAA Football season. In St. John's biggest game of the season to date, Schofield turned in his finest performance going 24-of-31 passing for 323 yards and five touchdowns. The junior quarterback did not turn the ball over as the No. 25 Pioneers dealt rival Shrewsbury its first loss, 42-34. Murphy had one of the best performances of the season for a running back so far, rushing for 301 yards and four touchdowns to lead Falmouth past Dennis-Yarmouth, 46-22. The win clinches the Clippers a share of the ACL title. Dussault had 11 rushes for 136 yards and four touchdowns to help Bedford snap a nine game losing streak with a 41-21 win over Boston Latin. King Philip's running attack was strong as usual on Friday night, with Halliday leading the way. The junior back rushed for 134 yards and a touchdown, while also forcing a fumble on the defensive side of the ball to lead the No. 18 Warriors to a 35-14 win over Franklin. Arvantis threw three touchdown passes to Ryan Topher, and ran for another to keep Holliston undefeated on the season with a 28-7 win over Hopkinton. Aylward gashed the Billerica secondary throughout Saturday afternoon compiling seven receptions for 180 yards and three touchdowns. Not to be outdone by his talents in the open field, Aylward also threw a touchdown to lead Tewksbury past Billerica, 35-14. Pream was the focal point of the Eagles' offense on Saturday, rushing for 144 yards and three touchdowns. The Eagles' back added a fourth touchdown on a 47 yard touchdown reception as St. John's Prep defeated Catholic Memorial, 27-20. Moynihan paced a high flying offensive attack from Westfield, rushing for 245 yards on 19 carries and four touchdowns to lead the Bombers past Chicopee Comp., 41-15. O'Furie was efficient, totaling three touchdowns on 12 carries to go with 90 yards. He also made his presence felt on the defensive side of the ball finishing the day with five tackles to lead Salem to a 26-14 win over Winthrop. Correa sure picked a good time for his first career varsity touchdown. The senior wideout corralled the game winning touchdown pass with 40 seconds left to lift the Rangers to a 20-14 win over Andover. Correa finished the night with five receptions for 115 yards.